Mexican Catering Laramie: Unmatched Mexican Catering from Qdoba! 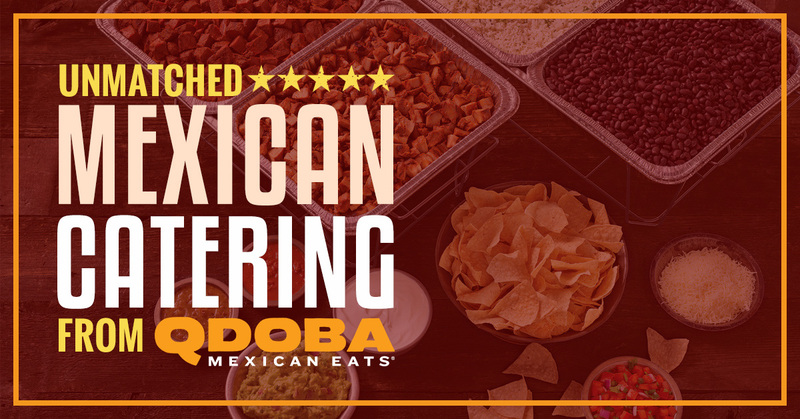 Unmatched Mexican Catering from Qdoba! Qdoba Mexican Eats wants to cater your next event! We have a catering menu that is sure to please every taste. When you are the one in charge of setting up the catering, it is important to keep the dietary needs of various people in mind so that everyone can participate in the meal. One group you need to keep in mind is vegetarians. There seems to be a vegetarian in every office, family, and on every team these days. According to statisticbrain.com, 7.3 million Americans were vegetarians in 2013, with another 22.8 million following a vegetarian-inclined diet. Be sure to provide for them too. One great way to make sure vegetarian and meat lovers alike get what they want is by ordering the Qdoba Naked Burrito Bar. Our burritos like to be free! They are free of the confines of a big tortilla; instead, they are served naked. The tempting ingredients of your choice are served in a bowl. You can layer the rice, beans, meat (if you so choose), sour cream, cheese, your choice of three amazing salsas, and our famous, hand-smashed guacamole. What you get is a bowl of mouthwatering Mexican eats! And what goes better with these delectable ingredients than tortilla chips? You can use the tortilla chips as the vehicle for the Naked Burrito or use a fork and satisfy your salty and crunchy cravings with chips on the side. Qdoba serves Southern Wyoming and Southwestern Nebraska with the best Mexican eats around. Call today and set up the catering for your next event.